This Armature Paper Inserting Machine is applied for many types of armatures, like power tools, mixer, vacuum cleaner, washing machine motor ect. (1) Confirm the shipping based on packing list after unpacking and check whether the spare parts being damaged during transportation or not. It only can be used after being installed and well debugged by our technician. (2) To make it run normally and ensure service life, the input voltage should be AC 380V (tolerance +/-10%), and the air pressure should be between 0.4 and 0.6Mp. (3) Reliable grounding protection is required. (5) Notice the running of the machine, stop it immediately when find any abnormal conditions. Only the malfunction is solved can the machine be run again. (6)The switch should be set on single action status when you check or maintain the equipment, and the power should be turned off. Make sure all input signal from sensor are correct, travel switch (X10) is pressed, no signal from counter sensor (X2), push bar protector (X7) and no paper sensor(x6) and full feeding (X4) ,Also, there is signal from the mechanical hand (X0) and magnetic sensor (X1) of small cylinder. Brake is power off or not. The feeding sensor(X3) should have signal if there is rotor on the guide way. Check cylinder and air pipe, make sure the pressure is between 0.4 and 0.6MPa. Check whether the paper is jammed in the feeding or discharging part, whether the upper press wheel is down pressed. Make sure the air pressure is 0.4 -0.6MPa. Check whether the magnetic valve is functional. Adjust the release valve of feeding cylinder to 0.3 Mpa. Check whether the mechanical valve is down pressed. Adjust the counter sensor screw and make sure it is on the right position after reset. If it was blocked in the forming tooling, the equipment would stop because the protective switch is on duty. If it was blocked behind the upper press wheel, press the stop button, now the mechanical hand still hold the rotors, press the single/automatic button to adjust it to manual, the mechanical hand will release the rotor, then take out the paper, and reset, adjust the button to automatic, and start the equipment. Looking for ideal Armature Paper Insertion Machine Manufacturer & supplier ? We have a wide selection at great prices to help you get creative. 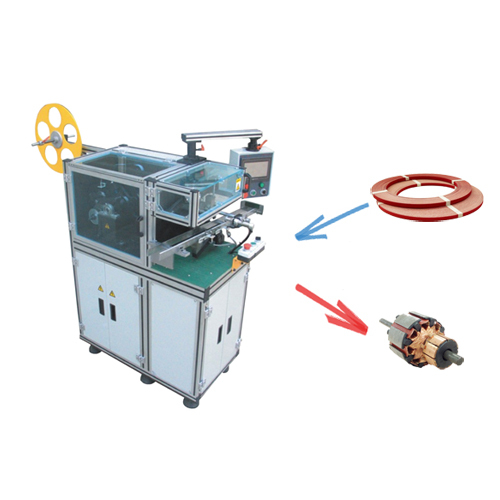 All the Motor Armature Paper Insertion Machine are quality guaranteed. We are China Origin Factory of Automatic Armature Paper Insertion Machine. If you have any question, please feel free to contact us.